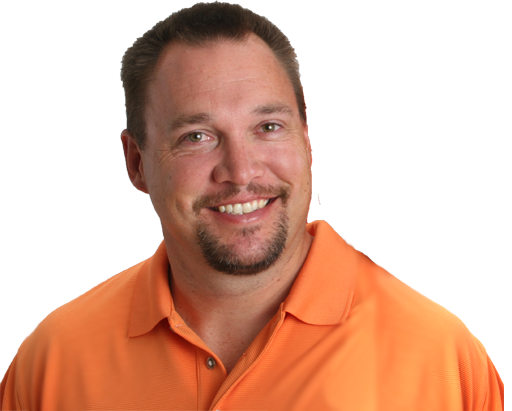 A line made famous by Jackie Gleason has become the motto for millions. But maybe we should change it a little to say "How Sweet is it?" Americans and much of the world is addicted to sugar and sweetness. It doesn't matter if it is good ol' fashion white sugar, high fructose corn syrup, or even an artificial (low calorie) sweetener, almost every processed food available has sugar or some form of it near the top of the ingredients list. Humans started out as hunter gatherers. We ate what was available - natural fruits, nuts, meats, and seeds. The diet was simple but it kept people healthy. There is really no evidence that early humans or modern hunter gatherer societies suffer from the chronic diseases we face today such as - obesity, diabetes, heart disease, osteoporosis and cancer. The only concentrated sugar source for early humans was probably honey and it was a minor part of the diet. Now sugar was becoming cheap enough for most everyone. Production increased from 200,000 tons a year in 1800 to about 8 million tons in 1900 to over 110 million tons in the year 2000. In the 1960's, the sweetener industry found an even better and cheaper type of sugar called High Fructose Corn Syrup. It was twenty times sweeter then sugar so less could be used and costs again could go down. There are 3 types of foods: proteins, fats and carbs. Proteins and Fats provide energy but they also perform other vital functions. Carbohydrates (sugar) only provides energy. Sugar is not necessary for survival. Within the carbohydrate group there are simple and complex carbs. Complex carbohydrates consist of long chains of saccharides - sugars - and include things like starches and fiber. Simple carbohydrates on the other hand are the mono and disaccharides that make up the complex carbs. 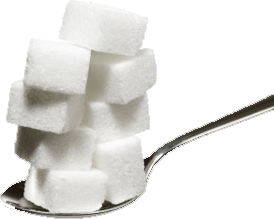 These are the basic sugars like glucose and fructose and sucrose. 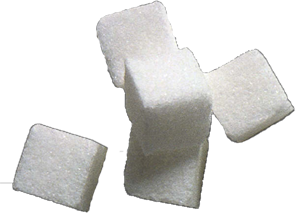 Sucrose is table sugar - it is a combination of glucose and fructose. In nature almost all carbs are complex or a combination or complex and simple sugars mixed together. Processing takes away the complex parts and often leaves just the simple carbs for us to consume. An example is when a fruit is juiced and the fiber is removed, all that is left are the simple carbohydrates. Simple carbs are absorbed quickly into your blood stream and cause spikes in your blood sugar. This contributes to many health problems like diabetes and obesity. As I mentioned earlier, sugar wasn't a staple of human's original diet plan. So why do we crave it so much. Looking back in time it could be said that people wanted sugar because it provided a quick fix for hunger. Sweet foods were also good and safe foods. Berries and fruits almost all have a sweetness to them and they are all safe to eat. These two reasons show why early humans looked for sweet foods and that carried over into modern society. Beyond the initial desire for sweet is the addiction sugar can create. Research has shown that sugar can create opioids in your brain that produce pleasure. Other drugs that do this are morphine and heroin. Finally, marketing - advertising - and the almighty dollar have created an entire industry to promote and sell sweet, sugar laden foods. Many of these ad campaigns are aimed at children. In fact both Coke and Pepsi donate large chunks of money to public school systems in order to gain marketing rights. These cravings and marketing plans have created a sugar epidemic. Sugar and other sweeteners have become a large percentage of the typical Americans diet. In 1880 the average person in the U.S. consumed about 38 pounds of sugar. By 1970 it was up to almost to 120 pounds in a year and now in this century most people are eating over 150 pounds of sugar every year. That's a cup or more of sugar everyday. It starts with babies and it is fueled mostly by beverages such as soft drinks and other so called health and energy drinks. 20-25% of toddlers drink 8 ounces of soda a day and it gets worse as they become teenagers. The average teen drinks 20-30 ounces of soda everyday! Just look at how the serving size has has gone up from 8 oz bottles to 12oz cans to 20 oz and 1 liter bottles. Now we have Big Gulps and Double Gulps. Soda has even replaced coffee for many people as their morning "get me up". But it isn't just soda that is filling us with sugar. Food manufacturers have jumped on the sweet tooth bandwagon and have 'hidden' sugar in almost everything they make. Take a look at the ingredients list on even the unlikely foods such as hamburgers, lunch meat, adult cereals, peanut butter, soups, frozen dinners, anything you microwave, and even medicines. We are in the middle of an epidemic. Obesity, diabetes, cancer, stroke, heart attack and other chronic diseases are at record numbers. The prevalence of sugar in so many foods is feeding our insatiable craving for sweets. Food manufacturers have made it so easy with the affordable and convenient processed foods that can be found everywhere. Essential Vitamins and Minerals are vital to good health! Take the extra step to improve your health. Because if you can't answer the question of "How do you Feel Today?" with FANTASTIC then you are missing out.